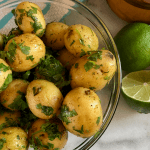 Cilantro Lime Potato Salad has officially been added to our arsenal of favorite potato recipes. 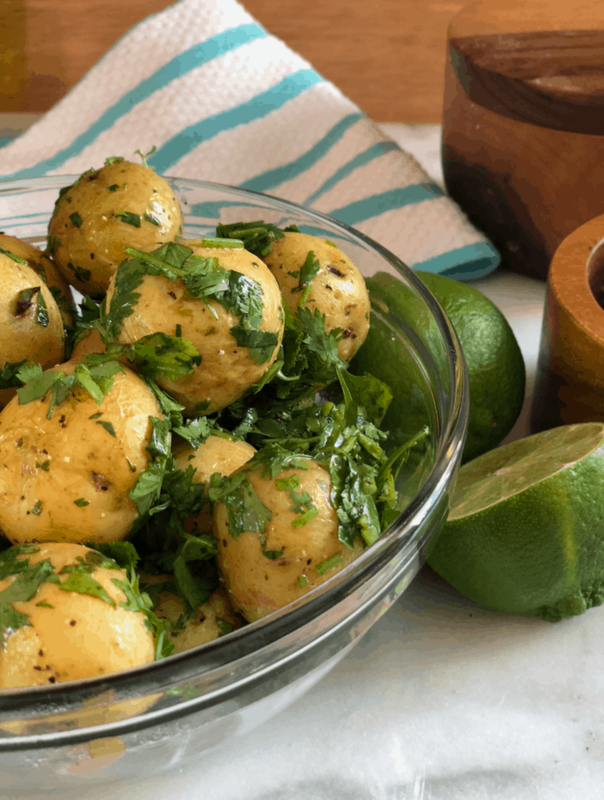 Light and delicious the tartness of the lime with the fresh cilantro is the perfect combination combined with yummy steamed new potatoes! 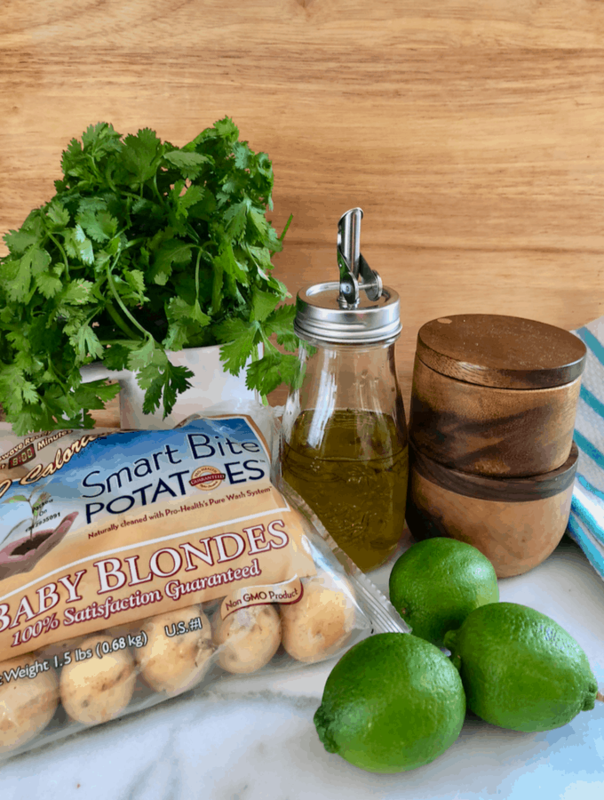 With just a few simple ingredients you can have the perfect potato side dish complete in on the table in less than 15 minutes! This is the perfect potato recipe for weeknights! 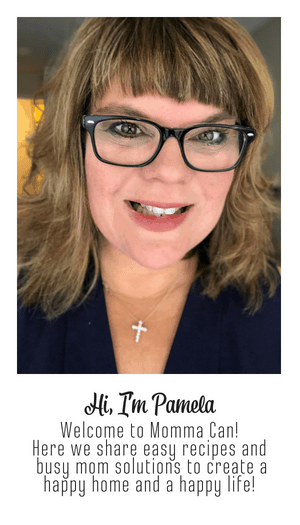 Why is this recipe perfect? I steam the new potatoes in the microwave and it is super fast! It is the perfect side dish for families of 4 to 5. Leftovers are yummy! I cube leftover to add to soups or make a quick breakfast vegetable hash! 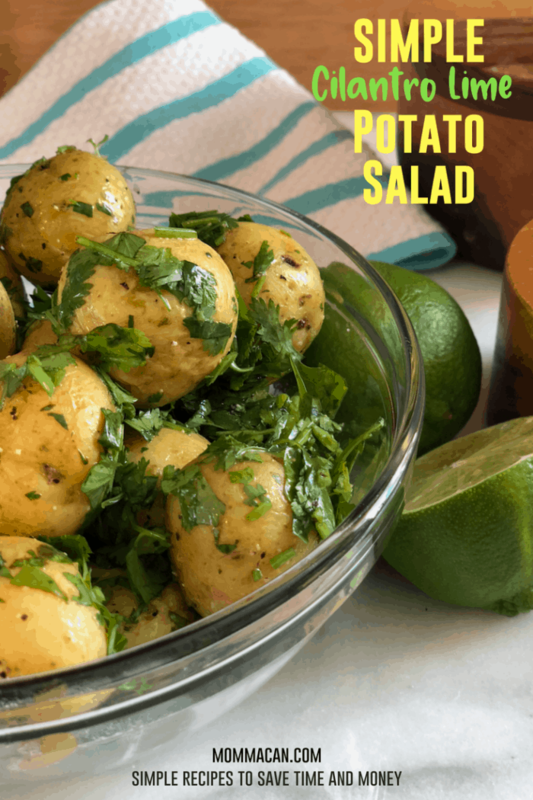 Let’s look at the Simple Cilantro Lime Potato Salad recipe! Step 1: Gather ingredients, and cutting board, prep bowls, measuring spoons, a good knife, zester, and citrus squeezer. Follow direction on Smart Bite Potatoes and microwave for 8 minutes. Step 2: Add potatoes to a glass bowl. Zest one lime and add to the top of potatoes. Juice two limes, depending on your taste buds. My limes were super juice so I used only one and a half. Step 3: Sparsely chop 3/4 cup fresh cilantro leaves. 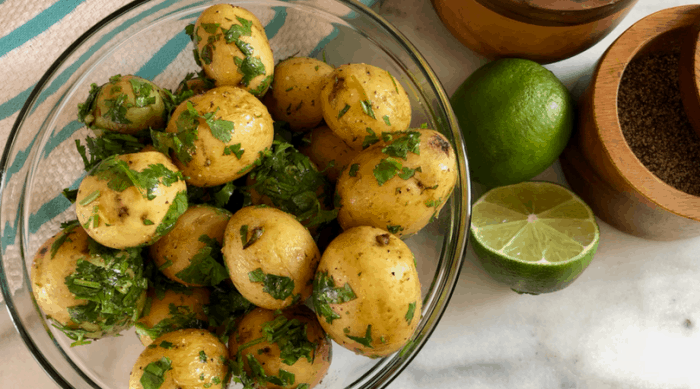 Add cilantro and olive oil to potatoes. Gently mix ingredients together. Salt and pepper to taste and gently mix again. I use a wooden spoon. Serve immediately at room temperature. Store leftovers in the refrigerator for up to two days. Enjoy! 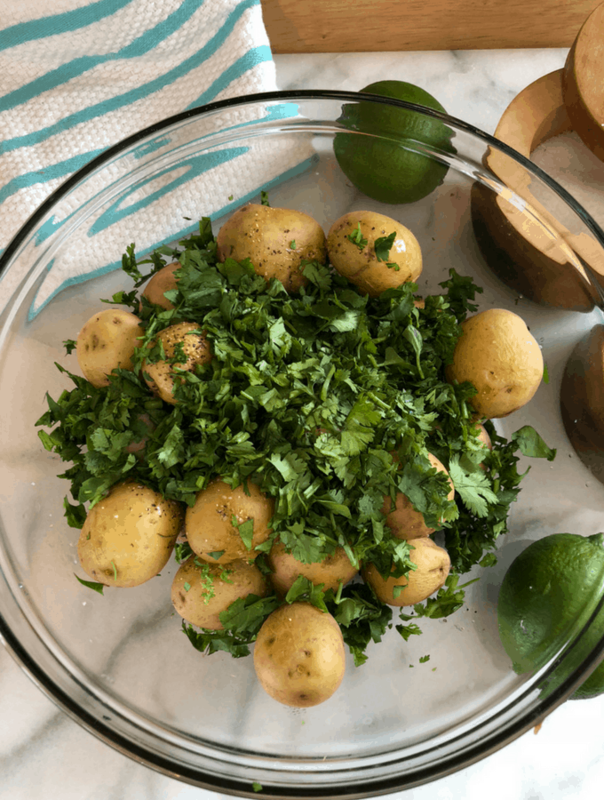 A zippy no-mayo potato salad recipe with fresh cilantro and tangy lime. Enjoy this dish with grilled meats or as a side dish for any occasion. Microwave new potatoes in the bag for 8 minutes as stated in direction. If you are using loose potatoes place cleaned baby new potatoes in microwave safe bowl. Cover with plastic wrap and microwave for 8 minutes until tender. 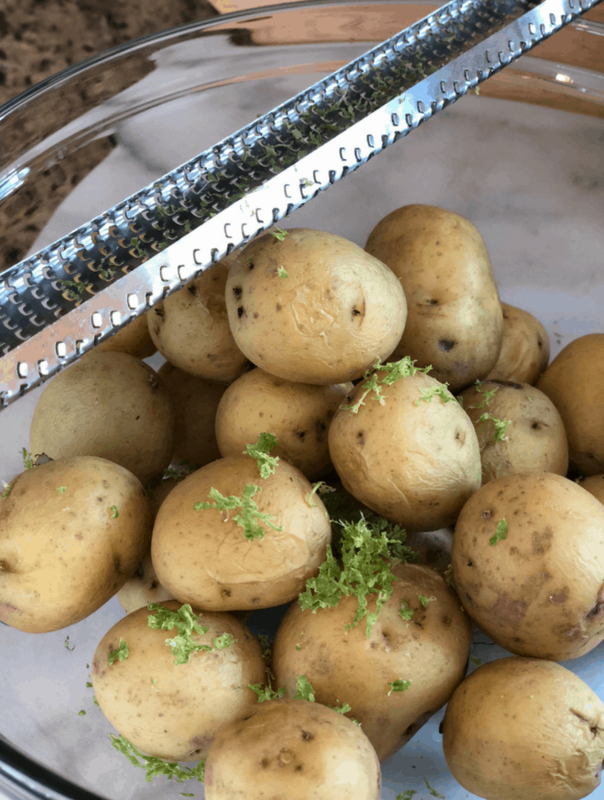 Place potatoes in a glass bowl, taking care there is room to fold in the ingredients. Add cilantro, lime zest, lime juice, olive oil and salt & pepper. Turn gently to coat potatoes careful to not break them. Salt and Pepper to taste and turn gently to blend. For added flavor throw in a tablespoon of garlic powder! This dish is a delightful side to roast chicken or flank steak. Serve right away, at room temperature. Refrigerate leftover for up to two days. It so good. I am going to try cauliflower next!